About two years ago, we examined the new Second Seed, a tactic employed by startups who raise an initial seed round, achieve a set of milestones and raise a second seed round, before raising a series A. During the two years since that analysis, this trend has continued. 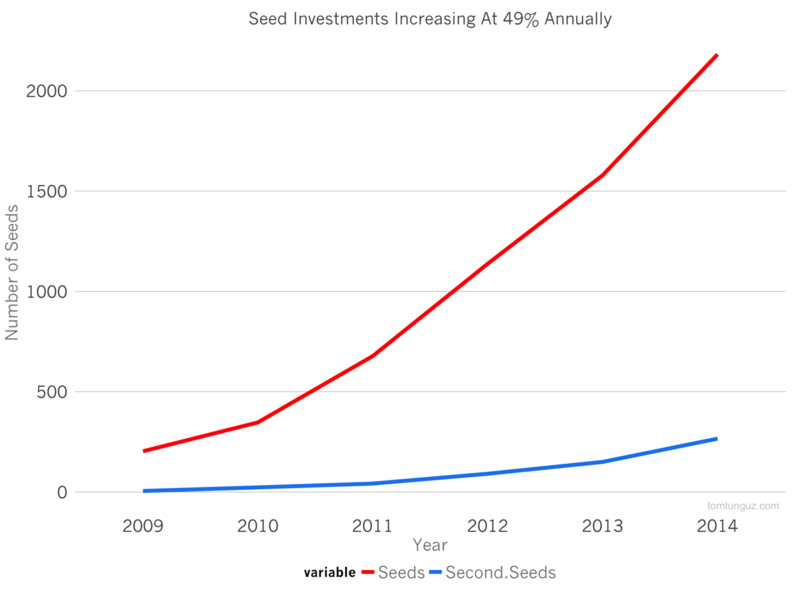 In the last 24 months, Second Seeds have grown From 7.5% to 18% of US technology seed rounds, both in number and in dollars invested according to Crunchbase data. And this growth in share is doubly impressive because the overall number of seats has been growing at about 49% annually. 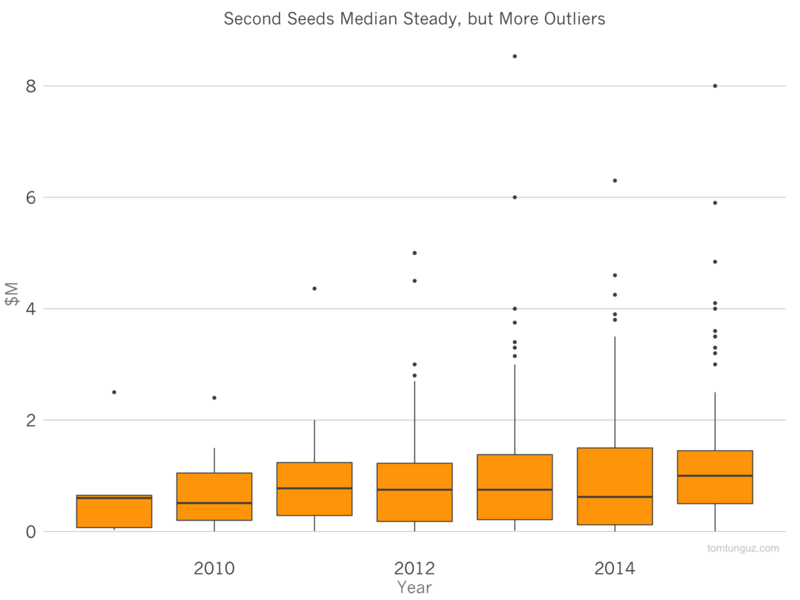 Second Seeds have been growing at twice that rate at 94%. 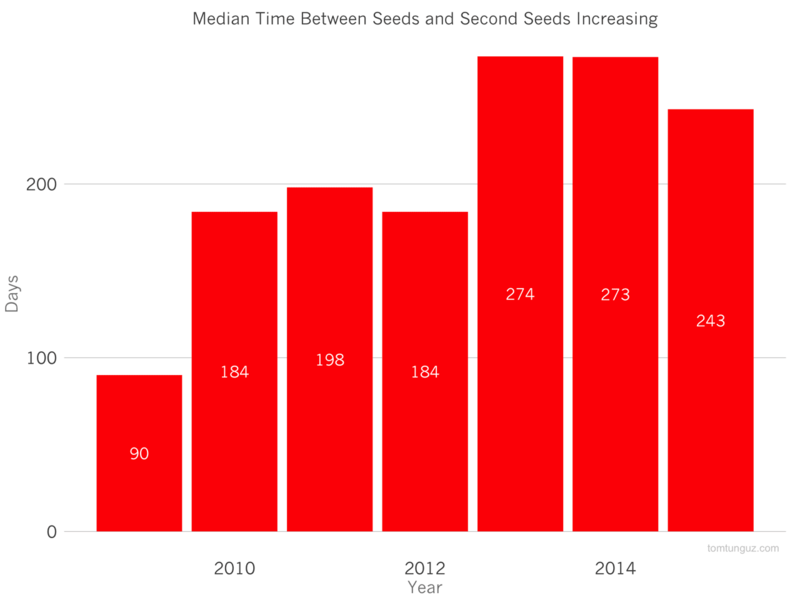 Second seed rounds historically have been larger than First Seed rounds. 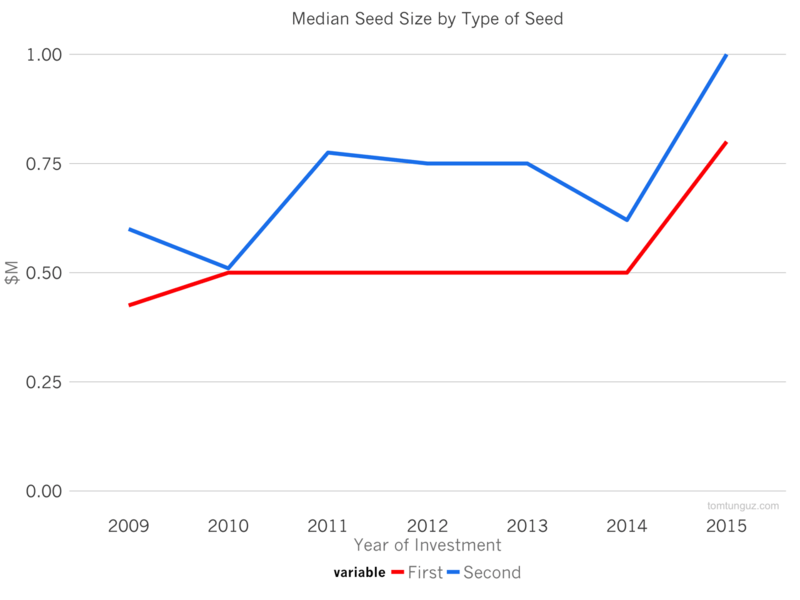 In 2015, the median Second Seed round hit $1 million compared to $800k for First Seeds. However, there is no statistical difference between the two. In other words, second seeds are not always larger than first seeds. The box plot above shows the changing distribution of second seeds by size. While the median remains relatively constant, the number of outliers, marked by dots, has increased. The chart indicates that in some cases, second seeds are Series A by another name. Interestingly, there are no investors in the Crunchbase data set that focus exclusively on second seeds. In other words, Second Seed dollars are provided by First Seed investors. This is probably because Second Seeds are most often invested in companies that are doing well, but need a little bit more capital to reach the milestones to raise a substantial series A. So, the existing investors, possibly in addition to one or two other seed investors, double down on the business to see it through. 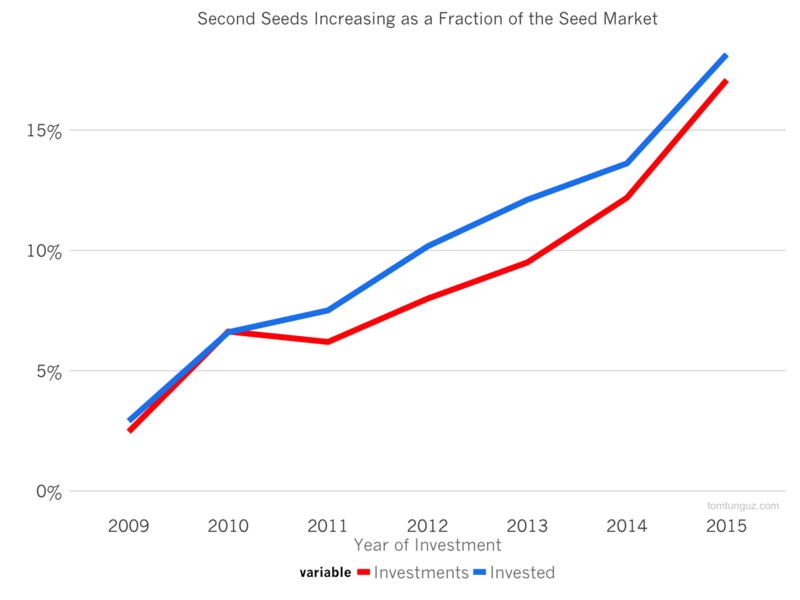 The first chart which shows the increasing concentration of the seed market in Second Seeds supports this hypothesis. Once a startup indicates some initial success, existing investors seek to buy more of the business. In addition, the 9 month difference between the first and second seed rounds, a difference that has been increasing over the past three years, supports the idea that Second Seeds are used to continue to develop momentum before the Series A. Whatever you call the Second Seed, I suspect it’s a financial product that is here to stay. Representing almost a fifth of the seed market, it’s also likely to become increasingly common.